Unit 24 Lot 16; TOT ID# 1646. Divine designer getaway with the best of everything. Contemporary design. Granite, custom cabinetry, buttery paint colors, handsome furnishings, bamboo flooring accented with plush custom area rugs throughout, high tech lighting and vaulted wood ceilings. Beautifully remodeled home located on a quiet cul-de-sac just a short walking distance to Shell Beach and Walk On Beach. The newly expanded ocean view deck addition with a new hot tub adds the finishing touch to this recently remodeled home. The expansive ocean view deck is equipped with a gas BBQ and features outdoor seating for dining. A perfect location for those who enjoy riding their bicycles on the private roads and bicycle trails throughout The Sea Ranch while enjoying fresh air and ocean views. After all that hiking and biking, immerse yourself in the hot tub under the stars or enjoy the tranquility of the jetted soaking tub in the master bathroom. This stunning home with tranquil meadow and ocean views, offers a gourmet kitchen with stainless steel appliances and gas cook top. Unlimited long distance telephone service included. 1 Dog allowed. Free Wireless Internet available at home. Bed linens and towels are not included with this rental. I was very pleased with the Sea Watch house and would stay here again. The home is lovely, well taken care of and nice to relax in. It is in a location with easy access to the beaches as well as highway, walking distance around the corner to one Eyed Jack playground and not a far drive from the Del Mar pool. The kitchen was well supplied with all items I needed for much "from scratch" cooking and serving. The wifi worked great without any connectivity problems as did the satellite TV. Games and puzzles are available. The hot tub is facing the ocean and well kept. The dogs were safe within the fenced in area from predators, until I was no longer able to use it when I realized there were snakes in it. The down side to the timing of my visit was long mid calf grass in the yard and was graced with a two foot snake across the walkway to it after a rain. It was raining throughout the week and new in the season at a time that ALL grass is long in the state right now so it was not a matter of not being cared for it was just an appropriate seasonal issue. I do not do snakes! We enjoyed both DVD players in the living room and bedroom. The view was fantastic in all rooms and watched deer all around us every day. The BBQ was in good repair and cleanliness and easy to operate. The only downside issues were that there IS a loft but the access is closed off to it with instruction prohibiting it which is rather torturous to an 8 yr old as well as I would have enjoyed reading it in also. We have stayed in homes with a loft and it was great. The Jacuzzi bathtub in the main bath did not work (outdoor hot tub is great however) and the main feature of the master bedroom, the telescope, was missing the piece inside of it that enables viewing so we could not enjoy that. There is also not much in the way of outdoor comfortable seating so you may want to pack your own lounge chair. All of these were very minor and did not prevent the overall beauty of this home! 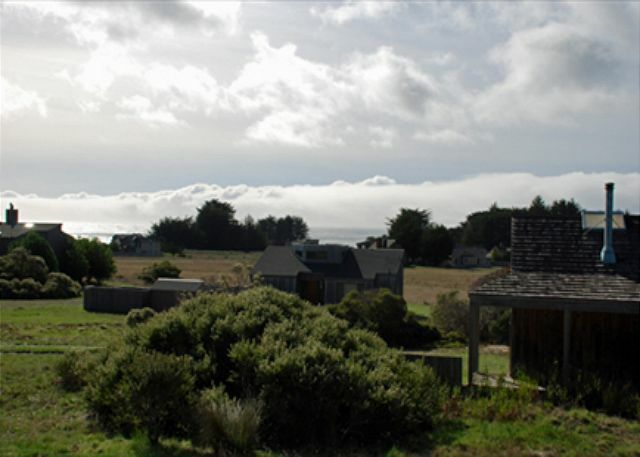 We are so happy to have found this lovely and amazing vacation rental in Sea Ranch. This home is the perfect get-away spot for us. Lovely and well maintained, with every amenity we could want or need. We'll be back! I've visited this property many times and it always delivers. Clean, comfortable, and well-appointed. Short walk to beach, sound of the ocean lulls you to sleep and with wi-fi and cable, you never miss a game or the outside world (unless you want to). This was our fourth stay at Sea Watch and, as always, everything was simply perfect. The location, amenities, and the care and consideration of both the owners and the office in making sure we are welcomed, simply cannot thank everyone enough and already looking forward to our next visit. This was our second stay at the Sea Watch house. We like everything about it: the view, the great kitchen, and the enclosed deck and yard. It is one of the "dog friendliest" homes we're rented, as the dogs can roam safely. Bonus: Beach Rentals is so easy to work with. Check Sea Watch out - you won't be disappointed. We spent a fabulous ten day September respite at Sea Watch in Sea Ranch, CA. We live about 90 minutes south so travel time was easy. We loved this home. 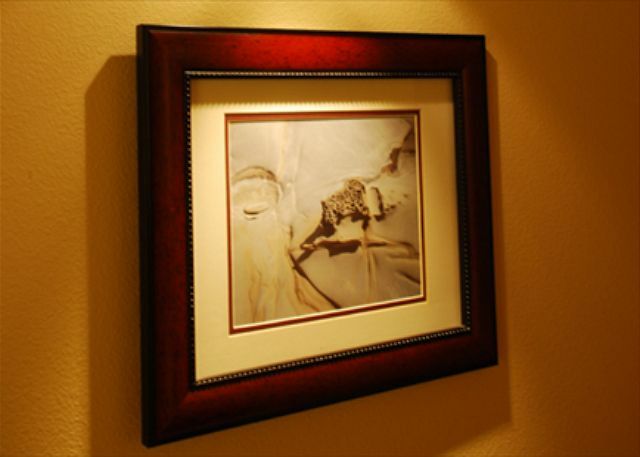 It's quiet, clean, well-maintained and offered us a secure place to vacation with our dogs. We can't wait to return! We stay here every time we go to Sea Ranch because for the upgraded quality of the kitchen and master bed and bathroom I have yet to find a nicer place for the price point that also allows dogs. We love the location to the beach 5 mins, and so many hiking trails both at the coast and in the woods. The hottub and sunny deck i;the afternoons is ideal after a long day of hiking. Oh and the links lets you bring your dog on the cart, so much fun! Sea Watch is perfect for us and our dog. We have been coming to Sea Ranch for over 30 years and this was our first time at Sea Watch. We will definitely return! It was a beautiful home and perfect for our four month old labrador puppy! Highly recommend - very relaxing - loved the deck and hot tub! Wonderful stay as always in magnificent Sea Ranch! This house is in a great location for us with proximity to the bluff trail and beaches, as well as easy road access for cycling. We love this place. 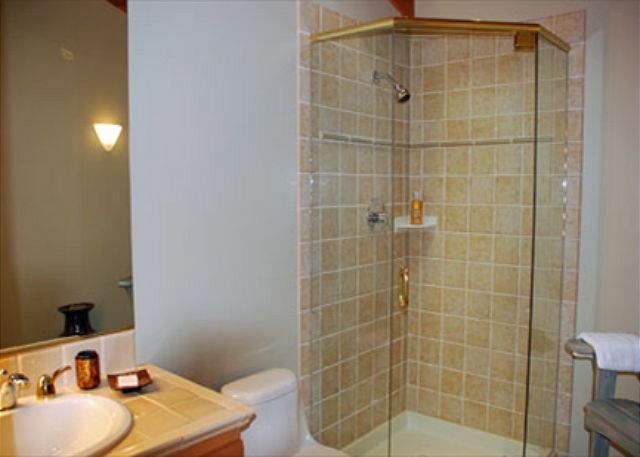 It is very clean and we appreciate all the amenities it has to offer. Many places are bare bones but this house has a very nice kitchen with everything needed even for a gourmet cook. The rental agency is top notch. We have been visiting Sea Ranch for ~30 years, often renting through Beach, but this was our first stay at Sea Watch. The photos just don't do it justice. The view is enchanting and sooo relaxing, the house is comfortable and nicely decorated, and the enclosed deck and yard are great for a dog. We also really appreciated the well-stocked kitchen with the thoughtful addition of many herbs, spices and other cooking supplies. We will definitely be back soon! Great location with a nice view of the ocean. Easy walk to the beach and very pet friendly. The home had everything we needed and the vacation rental staff were awesome. Great rental experience. This house is perfect for a couple or two or small family. It is also perfect for our fur baby with a fenced backyard. The house is in a great location near Shell Beach and No Name Beach. The house is nicely appointed and clean. Beach Rentals is great to work with. While there we went on great hikes, enjoyed breakfast at Two Fish Bakery and also went to Mendocino for lunch and wine tasting at Pacific Star in Ft Bragg. Weather was great - perfect mix of sun, clouds, fog, cool days and nights, but no rain! We had a wonderful time at Sea Watch. We appreciated that we could bring our dog along on our adventure and she was welcomed. The best rainy day vacation ever. We spent a week at Sea Watch this past December and enjoyed ourselves immensely. 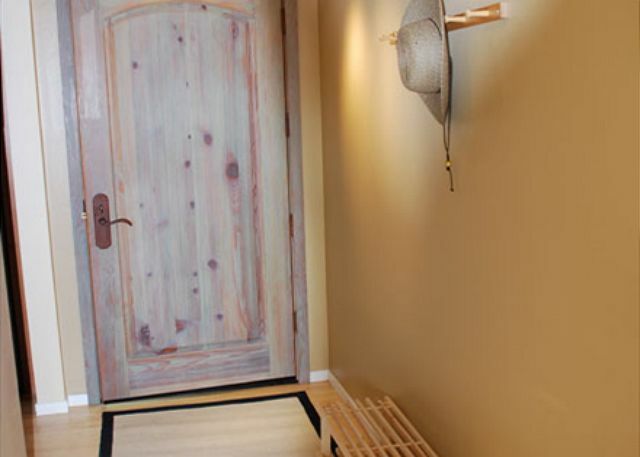 We appreciate the home's Asian-influenced decor, it's hot tub, and it's location to Shell Beach and Gualala. The one aspect I think would improve the home is to come up with a better heating solution. With all that said, we will definitely be back! This is the third time we have stayed at the Sea Watch House and used Beach Rentals. We have used Beach Rentals many times for rentals at Sea Ranch and the experience is always easy and well managed. Sea Watch has great ammenties for a couple or two or small family. The fenced in area is perfect for our dog, and the hot tub is wonderful. The Master bedroom is spacious and has beautiful views. Small kitchen, but is upgraded with stainless appliances and granite. Weather was the perfect combination of clouds, sun and on our last night rain! Love this house and location, with great proximity to bluffs, trails, and town. The house is well laid out, fully equipped, and recently remodeled, and one of our favorites of all time at the Sea Ranch. 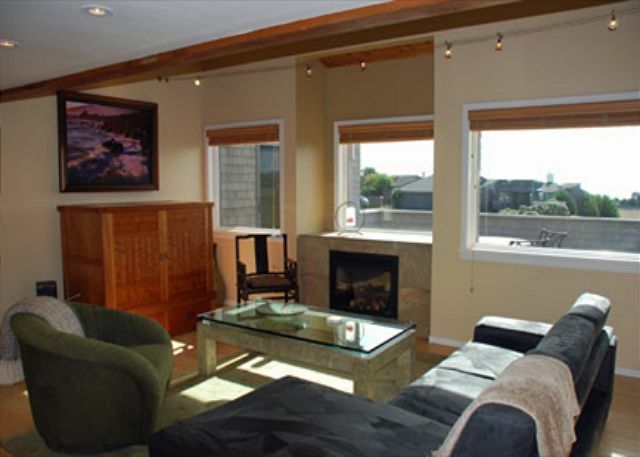 The house is comfortable, lovely, and well located near the harbor seal beaches and beach access. The downside was that the television in the living room didn’t work nor did the jets in the indoor tub. Also there was no instruction manual for those items so we had to figure it out on our own. I loved this home. It is clearly well kept and well loved. The deck is expansive and the hot tub is perfect for 2-3 people at a time. I had brought two chairs and I'm glad I did as there is really only one comfortable adirondack chair to sit on. The metal chairs around the table are sturdy but not cushioned. If there are other chairs or chaises available, that would have been nice as two others were shown in the photos, resting in the grassy area. The deck and grassy area are all fenced in, making it perfect for bringing a dog. The home is not huge but it is perfect for 2-4 people who really get along. The master bedroom is huge and the second bedroom is cozy and quite pretty. 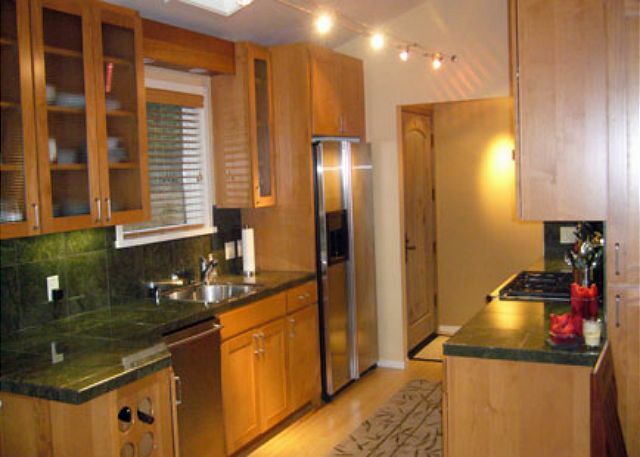 The galley kitchen is well appointed and the bathrooms are beautifully designed. A lovely home. Thank you so much for making it our home away from home! We love Sea Ranch!! It was the perfect time to escape the heat and come over to the coast. We had perfect weather, cool overcast skies and clear blue skies. Sea Watch house is perfect for one or two couples or a small family. It has a great fenced yard so that your doggie is safe outside. The house is tastefully decorated, but relaxed. Great master bedroom with comfortable bed and pillows. It is wonderful to wake up and look out to the ocean. Everything was clean and is well taken care of. Beach Rentals even welcomed us with a bottle of wine and goodies for our dog. Great hikes, ultra low tides and just relaxing. We enjoyed our stay so much we increased our stay by one night! We'll be back! We just finished a relaxing weekend at Sea Watch. The big storm of the season arrived during our stay which kept us indoors the majority of the time. We did enjoy sitting in the hot tub as the rain came down. The kitchen amenities were new and good quality. The beds were comfortable. A few issue we did experienced were. The only heating element was the gas fireplace. There is no central heating, so the bedrooms and bathrooms got cold. I called the property management and the brought 2 portable space heaters and the problem was resolved. The other item that should be addressed is the sound system to the TV. Otherwise it was a great place to stay. Probably the best overall house we've ever rented in more than 20 years of visiting the Sea Ranch! Perfect location with proximity to beach, roads, and trails, amazing views from the front deck, and the remodeled kitchen, floors, lighting, etc. made this a fantastic place. We also appreciated the enclosed yard area for our dog, and all of the amenities. We would definitely recommend this place and plan to return for another visit soon. Nice home in a beautiful location. This is a beautiful home in a wonderful location near shell beach. It is clean, bright and well furnished. There were only a couple things that struck me as odd. Why aren't bed and bath linens included in the rental? Why is the dining table so large for the space? Enjoyed!! Ocean view was more limited than I thought it would be and the living room furniture was awkward. Beautiful coffee table but took up too much space. Simple end tables and a fan would be great. Overall awsome place and extremely dog friendly. We have stayed here multiple times, because the house, its location, and the amentities are all so perfect for me and my husband and our dog. In addition, we would never use another rental agency after using these guys (terrible experiences with others in the area led us to them). I had a weekend alone w/ my dog and decided to pop up from SF. 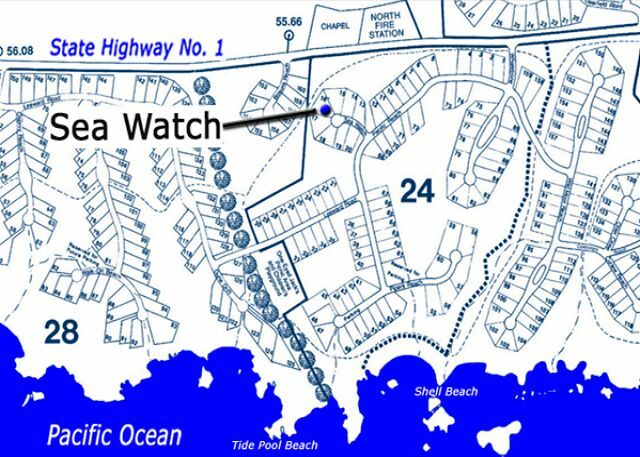 Sea Watch is newly updated, clean and quiet. Exactly what I was looking for a weekend getaway! this was our 2nd stay at sea watch. we love the home and it is great to be able to have our dog. everything was excellent. I would like it if there were more outside chairs. That is my only complaint. We plan to return VERY SOON. Overall Sea Watch is a very nice home. A few minor things need to be attended to. The refrigerator is very noisy when the compressor is running and on the back deck there is only one chair. This really limited how much time a couple could spend together on the deck. We did have three raccoons come into the house by sliding screen doors and coming through window screens, which limited our ability to have the wonderful fresh sea air come in at night. One of the main attractions to us at Sea Ranch is the abundant and diverse wildlife but having them, literally, in our bed, is a problem that Sea Ranch needs to attend to. Beach Rentals was terrific in every way. I took my twin daughters (age 14) and my yellow lab to Sea Ranch for the first time and we felt quite fortunate to have selected such a lovely home. The photos don't do it justice. It was beautifully decorated and cozy. The lighting (natural and installed) was amazing. Most importantly, the home was immaculate, beds were comfortable, everything worked and we felt safe. Thank you for allowing us to "borrow" your lovely home. It was a very nice house. Very well located next to a walking trail and the ocean but far enough away to sit at night and enjoy the peacefulness of Sea Ranch. My family and I enjoyed our stay as we do every year. The house was great with all the amenities you could ask for. The enclosed patio was great for our dog. Couldn't have asked for a better house. This was one of the nicest sea ranch homes that I have ever been to! This weekend was sort of a last Hurrah for our family because our youngest 3 grandchildren are going away to college and things will never be the same for my husband and I as far as having them around and attending their functions, meets, etc. It is a sad/glad sort of feeling because they are all going into great universities but at the same time we will not be seeing them very often any longer. Our children and grandchildren rented another house but we I think had the best house. It was lovely and we enjoyed our stay there very much. Great house, location, and accommodations! The house itself is exquisitely desinged inside, and very comfortable. It has a great kitchen for cooking, a nice big deck and fenced in yard for the pups. Also, it is a <5 minute walk to the beach and to great bluff trails. The rental agency themselves are always such a pleasure to work with, I would never use any other company after using them. We had a wonderful time at Sea Watch! The house is beautifully designed and decorated! We brought our Labradoodle, Stella and she was made quite welcome wither welcome pack and perfect enclosed yard. The views during the day are gorgeous and the night sky from the hot tub was amazing. There is a trail off the back that goes along the woods and the trail to seal cove is an easy walk from the front steps! Beautifully appointed comfy meadow home, one of the nicest we've stayed in at Sea Ranch, and we've been vacationing there for 20+ years! The coastline, the quiet & the viewers are peaceful and special. If you wish to rest and relax there is no better place. We've stayed in Sea Watch three times. This time for 3 weeks and it was wonderful...like home plus a hot tub and the ocean. Everything was in good condition. The home was well laid out and very comfortable to stay in. Close to the beach and walking trails. We loved our week at Sea Watch over Christmas. House was great! Our dogs loved the yard and deck. The hotub was beautiful, especially at night. Our son loved the wifi and TV. He brought his PS4 so he was in heaven. Kitchen was well appointed, except we needed a larger wisk and a rubber spatula. lol We will be back! I hold dear to those memories I make at Sea Ranch. It is an unusually peaceful beautiful place. If this is what you like then this is the place to go. This house is wonderful. Beautiful home with a Zen ambience. Great views from expansive decks and home. If you haven't stayed in Sea Ranch, try it. We were at Sea Watch house this time, up to date, well located, nicely furnished. Three days of peace, quiet, and beauty. Beach Rentals, who set up the stay for us, were wonderfully efficient. We had a lovely time and "Sea Watch" home was very nice. It waso peacful and relaxing - love that it was a close walk to the beach. Had a wonderful time! Judith Mullen & family. 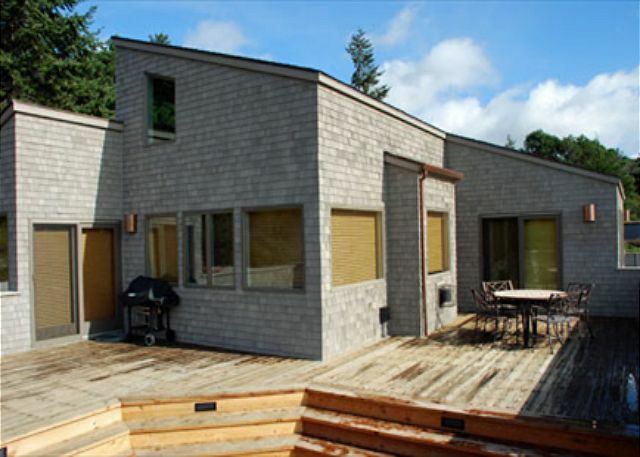 Clean, quiet, comfortable, over all great rental & the serenity of Sea Ranch is awesome! Hot tub was great too! The kitchen was so well stocked we didn't need anything we brought with us. The beds are very comfortable. Our two dachshunds enjoyed the deck & fenced yard and their welcome pack with pretty towels,sheet for couch, leash & treat were a Four Seasons type touch. The only thing missing was a flat surface in the bedrooms to toss stuff & a shelf in the small bathroom would be great or small tables. The grill was easy to use & we made use all 3 nites. 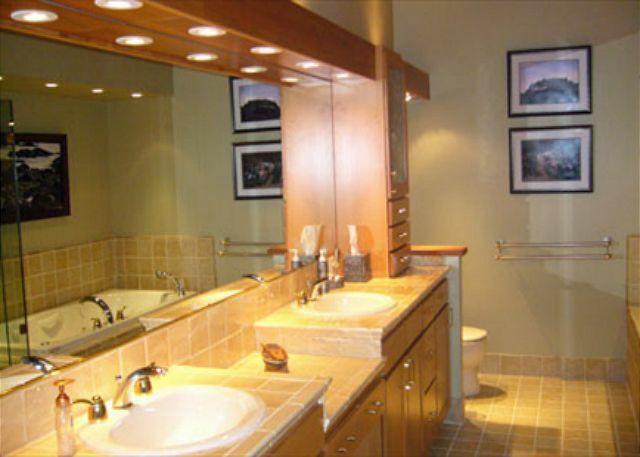 The large bathroom had more space & storage than my first apartment, We loved our 3 nites in this beautiful home & look forward to returning in the spring. We are two friends celebrating a major birthday &' wanted quiet place. We had a wonderful time at Sea Watch. If there is something to suggest, I would replace the toilet seat in the guest bath. It is faded and stained looking from the sun coming in through the skylight. Overall, it is a lovely home! The home is exquisitely furnished and appointed. Truly a Zen-like environment that promotes total relaxation. 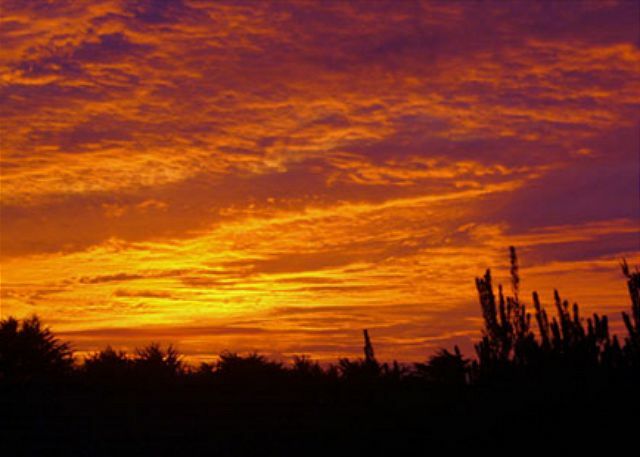 We have stayed in many Sea Ranch homes over the years-Sea Watch is one of the best! We especially appreciated the fenced yard for dogs. Excellent! This house had all the amenities, a good location, nice neighbors, and a quiet night's sleep. It was the escape we needed. The ladies in the rental office were friendly & professional. Seeing that rental had preference for one dog only, called and they arranged for our two small dogs (cheweenies) to stay, providing them treats and own towels to be used after exploring the nearby beaches. Blue water view off deck &, more importantly, from hot tub. Were having so much fun wanted to extend stay but unfortunately booked right behind us. Plan to stay longer next time and already looking forward to next visit. Nice place close to private beach! Nice play to stay. The pictures do not do the house justice. This house had it all. Wonderful layout, fenced yard for the dog, hot tub, wonderful meadow and ocean views. We can't wait to come back. Very nice house with ocean views and good hot tub. Gas stove a big plus, and dog friendly. Great amenities: gas stove, nice artwork, jacuzzi tub, we will be back! We loved that the kitchen had new appliances and was well stocked, and the view from the master bedroom was spectacular. We kept the levelors up day and night. We would definitely recommend that place to our friends. My husband and I stayed at SeaWatch over the Thanksgiving holiday, and must say everything was perfect. Nicest house, location, and rental agency we have used so far, and we have stayed a few times at Sea Ranch. The house is close to many beaches and other attractions. It is also absolutely perfect for a dog! If you are entertaining, it is also ideal, as the house layout is ideal, as well as the great big fenced in deck. Hot tub was a plus. Overall great house, great everything, we will try to score this house on our next trip next year and beyond. This is a true favorite in every way. I love the modern decor of the home and the views were lovely. The pictures of this home don't do it justice. We were pleasantly surprised at how comfortable, clean and beautiful the home was. The kitchen is well stocked. We loved making meals and just relaxing. Our 5 year old loved hanging out on the deck with the binoculars. We look forward to staying at Sea Watch next year. Updated home with fully functioning kitchen, yard for our dog to do his business, closed deck for the kids to play in, nice hot tub. Great walk to the playground and Shells beach. A curiously arranged house with an inaccessible interior "concept" balcony and a mysterious front door located on the back of the house, the building is in good condition with a newer interior including a telescope (nice detail) and a small hot tub. Overall great house and experience. Beautiful location and setting. Nice layout and spacious rooms. Kitchen could use a few more bowls and basic serving platters, etc. Spa controls a little confusing. Not sure is A/C was included or working. Got a little warm in the afternoons! You probably won't find a more lovely home to rent than this one. The lighting and bathroom were Sunset Magazine-worthy. The deck has a distant ocean view and privacy, and the enclosed grass area is a perfect one for dogs. The home is also near to a beach that is perfect for watching harbor seals, especially during their birthing period in April and May. A great experience for our first time at Sea Ranch. We'll definitely be back! We were there twice now, 30 days for last year and this year. We really enjoy the house, Sea Ranch etc. and gorgeous weather. This was our second Holiday spent at Sea Watch and it was just as we remembered... wonderful! This visit we saw so many animals, deer, fox, jack rabbits, quail - to name a few. We'll be back next year to continue our tradition. Sea Watch was lovely. We'll definitely be back! It was wonderful. We loved the house and location. Our only suggestions are that the living area be made more reader friendly with lamps and more comfortable seating (for evenings and rainy days) as well a a space somewhere for a computer. However, overall, it is very nice and we enjoyed our stay. We love sea ranch and definitely will be back next year. Sea Watch is a beautiful home. The only issue we had was pet stains on some of the carpets that needed cleaned. Other than that, the place is great. Beach Rentals does it right - all the best touches, including a welcome note (and treat) for our dog Buddy. No need to look for any other properties. This is it. It was a dream. The property was beautiful and spotless. It was luxurious but did not feel out of place amongst the wildlife and trees. The owners have put thought into this home, and it is a comfortable oasis in which to escape the mundanities of life and live a dream for a few days. We will definitely be returning. The house is well designed and constructed. 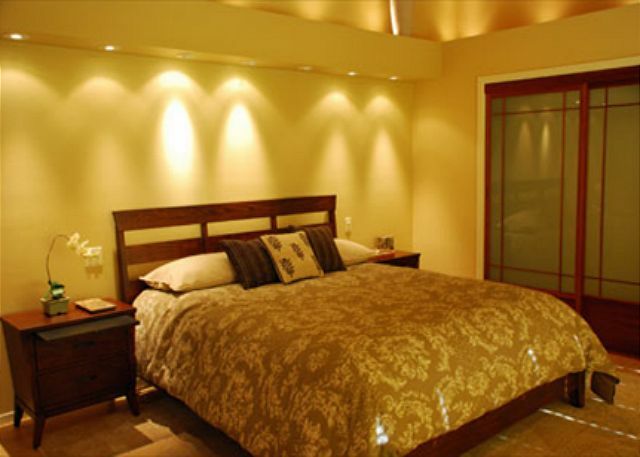 Great lighting and good separation of bedrooms. Comfortable and esthetically pleasing. We will return! This house very wonderful. The lighting is something is fantastic. The location very near Shell Beach is also great. Overall we had a great one week stay. And best of all the house accommodates pets, so we were able to bring our two cockatiels with us. We will definitely try to rent this house again. This home was very warm and inviting. We had one of our best trips ever! The house was beautiful, the decor, the colors, the furniture was great. We had wonderful weather for three weeks, the last week was raining but we expected that. We really like Sea Ranch, and we would love to stay in Sea Watch again. Willow,our Golden Retriever, loves it also! It was a great experience. I would rent this home again. The only criticism would be that there was not any trash bags and once we used the papertowels on the holder there were not any replacements. Other than that it was great. Thank you. If you want to relax and vist the wild ocean , this is the place for you. It is quiet and peaceful. This home is lovely. We loved the house. It was in great condition and our dogs loved the yard.